Beirut, Lebanon — Last week, the Free Thought Project reported on the case of Prince Majed bin Abdullah bin Abdulaziz, 29. Abdulaziz was arrested and then let off by prosecutors in Los Angeles who claimed they didn’t have enough evidence to charge him with kidnapping and sexual assault. These charges were dropped in spite of the fact that multiple witnesses watched a woman covered in blood scale the 8-foot walls of the Prince’s Beverly Hills mansion, screaming for help. Two other women also claimed to be held captive in his mansion and raped. Abdulaziz is the son of King Abdullah the former ruler of Saudi Arabia, America’s unscrupulous ally in the Middle East, so this special treatment comes as no surprise. However, what authorities are saying his cousin, Abd al-Muhsen bin Walid bin Abd al-Aziz Al Saud, has done is shocking. On Monday morning, Abd al-Aziz Al Saud was about to conduct a flight from Beirut’s Rafik Hariri International Airport on his private jet when he was intercepted by security forces. 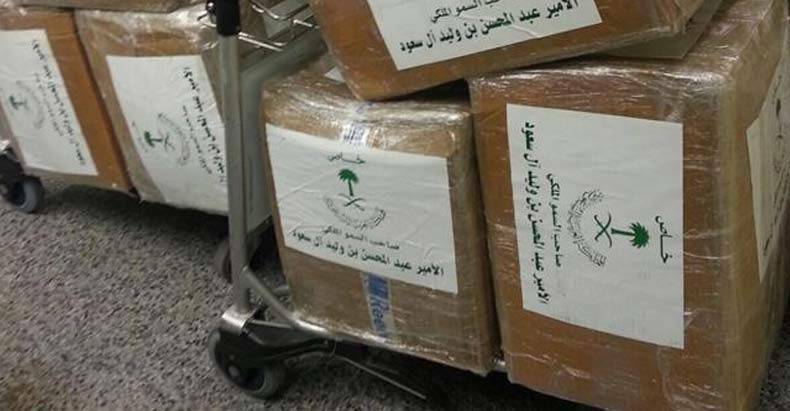 Abd al-Muhsen bin Walid bin Abd al-Aziz Al Saud was detained at an airport in the Lebanese capital, Beirut, while in possession of 24 bags and eight suitcases full of narcotics. They were packed in his luggage, weighing about two tons, which aroused suspicions among the security forces and led to their discovery. Inside the luggage, Lebanese officials found packages containing two tons of captagon pills. For those unfamiliar with captagon, it is an amphetamine-based drug ISIS fighters have been using to stay alert in battle. NNA reported that 40 bags of Captagon pills were found by inspectors from the Gendarmerie in cases due to be put on board a jet bound for Hael, in northern Saudi Arabia. The US government’s loyalty to Saudi Arabi is unquestioning despite their horrific and violent track record of human rights violations and beheadings. Now we can add international drug smuggling to their long list of illegal behavior. After Russia reportedly destroyed a large portion of IS forces in Syria earlier this month, the US immediately dropped in 50 tons of weapons. It seems that stoking international war by creating and supporting terrorist groups is becoming harder to hide from the world who’s becoming weary of fighting. Correction: It was originally reported that Prince Majed bin Abdullah bin Abdulaziz was the one who was caught trafficking the drugs. However, it was actually his cousin, Prince Abd al-Muhsen bin Walid bin Abd al-Aziz Al Saud.